The Hills Entoto is an important isolating line, to the north water flows to the Blue Nile, to the south to the Awash River. Mount Entoto is the highest peak, reaching 3,200 meters above sea level. 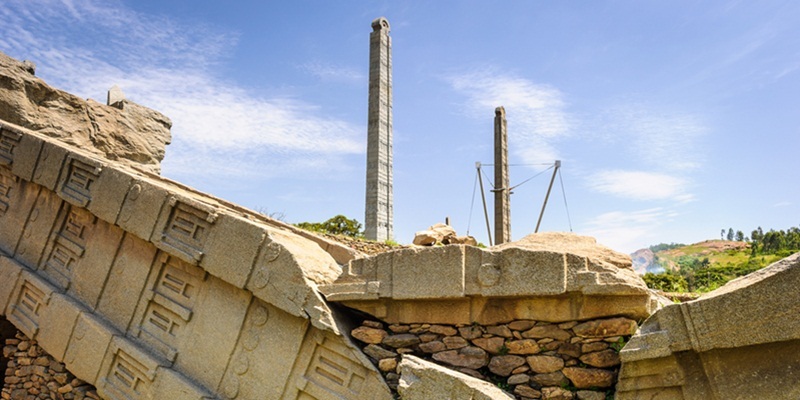 The area of Entoto, a region on the edge of Ethiopia’s capital city, the hills were the site of Meneliks Capital befor addis ababa wea founed in 1887. Emperor Menelik II made his permanent camp there in1881.Taytu left the Entoto Mountain camp because of the unlikable cool temperature and was drawn to the site of Addis Ababa to the hot springs. And also it is difficult to provision and there was a shortage of wood and to have named the new capital Addis Ababa, or New Flower. What most attracted Queen Taytu’s consort, were the hot springs on the lower south-facing slopes at a place called Filwoha were she and many companies paid frequent visits to enjoy the hot gushing mineral waters. The fresh and cool air, the exuberant flora and the pungent aroma of the eucalyptus trees alongside the road make the hills wonderful which its panoramic view of the city and the surrounding areas,. Entoto museum Saint Mary museum, which contains a collection of some of the Emperor’s possessions, and learnt that he was a humble man, sleeping on a simple wood and hide bed, and only wearing shoes on very special occasions, march of Adwa against the Italian invasion, the bed Menelik II used while in Ankober, a crown and a Persian carpet are just a few of the many exhibits depicting Entoto’s glorious past. Entoto Maryam church is an octagonal church in the compound where Menelik was crowned in 1882 and traditionally painted. It is the orginal church built on the site, the belltower and the “throne” where Emperor Haile Selassie sat during his annual festival for the locals. Menelik’s palace The palace is a very simple3 small stone and wood building with straw roofs with a guest house, a bedroom, and a dinning and storage house. The rooms were bare, but one interesting feature was the ceilings, made of strips of animal hide. Church is a rock-hewn church and a newer stone church with a fantastic collection of paintings around the central “holy of holys” part of the church. The first church, Kidus Raguel, was dug out of the rock about 700 years ago. The church it had 3 compartments like all Ethiopian churches that representing the trinity. Africa Hall is on Menelik II Ave – an imposing symbol of African independence and optimism. It houses the headquarters of the UN Economic Commission for Africa. The huge stained glass windows depict the suffering of the people of Africa. The Filwoha springs are just to the west of the Africa Hall. These springs, which have obviously lost some of their former beauty, prompted Queen Taytu to persuade her husband to establish his new capital at Addis Ababa. The thermal waters are now diverted to an adjacent bathing complex. St George’s Cathedral (Giorgis Cathedral). Lies at the north end of Churchill Rd. 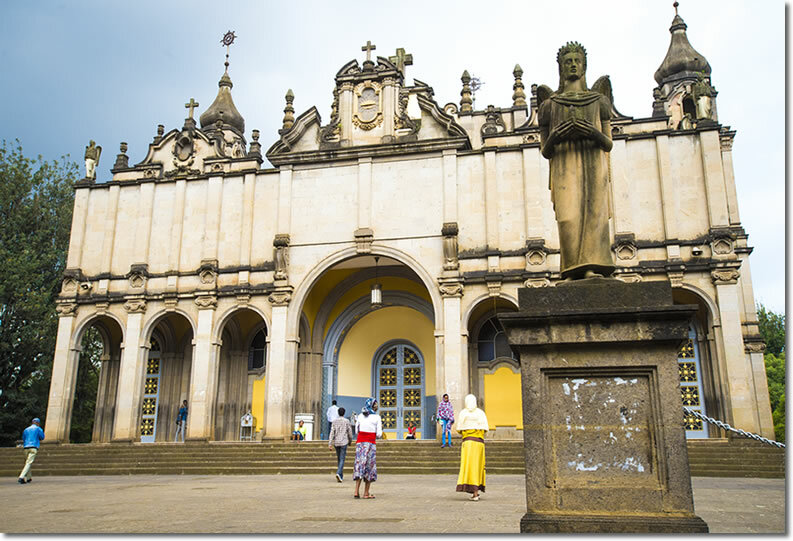 Built in 1896 in the traditional octagonal shape to commemorate Ethiopia’s victory over the Italians at the Battle of Adwa, the Cathedral houses the work of Afewerk Tekle, the renowned Ethiopian artist responsible for the stained glass windows of the Africa Hall. There is a small museum in the compound. The Menelik Mausoleum built in 1941 to serve as the tombs of emperors and princes, and the Trinity Cathedral, are located nearby St. George’s. 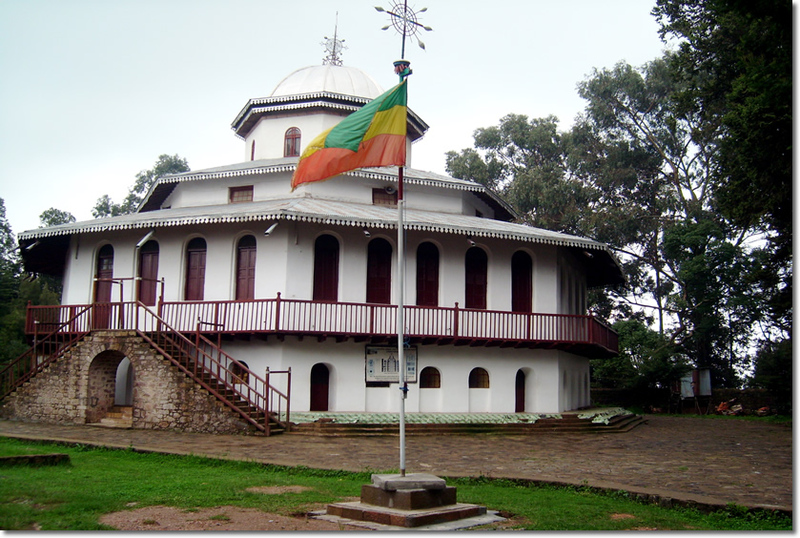 The Trinity Cathedral was built to commemorate Ethiopia’s liberation from five years of Italian occupation. HaileSelassie’s Grand palace is located north east of Churchill Ave at the end of Colsen St. The Emperor has a second residence, Jubilee Palace, on Menelik Ave, just north of the Ghion Hotel. The small National Museum is located at sedist Kilo crossroads, just north of St Mary’s Church. Guides are the only real source of information, since the exhibits are poorly labeled, but they vary in standard. The exhibits are varied, and include Lucy; the female fossil skeleton found in northeast Ethiopia in 1974, believed to be about three and a half million years old. The museum has an extensive collection of artifacts, some predating the Axumite civilization of Tigre. It also includes a selection of the more than 200 designs of crosses found in Ethiopia. Near the museum are the Lion Cages, probably the only place in Ethiopia to see the Abyssinian lion. The cages are probably best to be visited by animal lovers. In Menelik II Square stands the imposing equestrian statue of Emperor Menelik II. The statue was erected by Emperor HaileSelassie and dedicated on the day before his coronation in 1930, in memory of his great predecessor. The square is located outside the main gates of St. George Cathedral and is close to City Hall. The distance markers on all the highways in Ethiopia mark the distance to their location from the base of the statue of Emperor Menelik II in this Square. Every year, on the anniversary of the victory of the Battle of Adwa, the Emperor would lay a wreath at this statue after attending mass at St. George Cathedral (the victory had occurred on St. George’s Day). Col. Mengistu continued laying a wreath here on the anniversary, but did not attend the church services as his regime was Marxist. 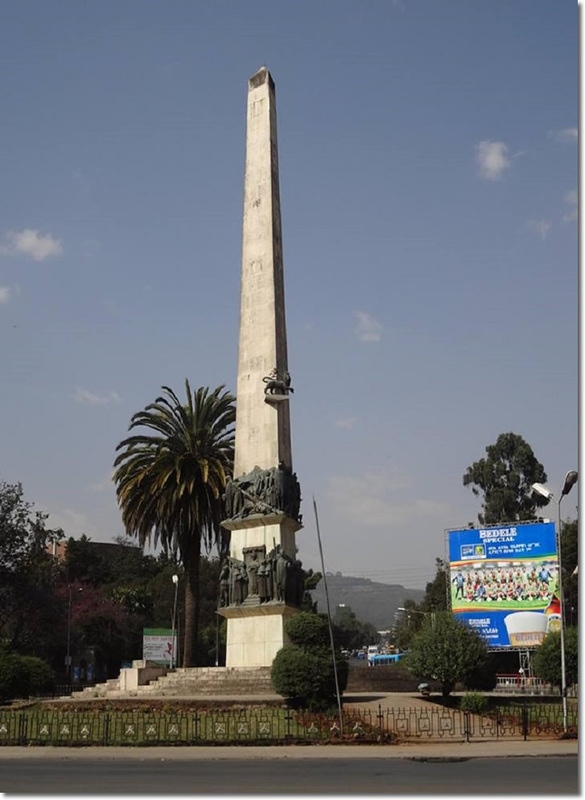 The Yekatit 12 Square (Sidist Kilo) monument stands in tribute to the thousands of innocent martyrs butchered by the Fascist Italian Occupiers on that date in the Ethiopian Calendar year of 1929 (1936 Gregorian Calendar). The massacre took place at the order of the Italian Vice-Roy Marshal Grazziani in response to an assassination attempt against him carried out by two pro-Ethiopia Eritreans. The monument is shown here during a religious procession of priests of the Orthodox Church, probably at Timket (Epiphany). Wreaths were laid here by the Emperor to commemorate the massacre every year. Col. Mengistu Haile Mariam continued this practice during his rule, but for a time after the fall of the Dergue regime, only the Mayor of Addis carried out this practice. Recently, the President of the Federal Republic has taken over this task. The monument is in the form of a white obelisk with black bas reliefs of scenes of the massacre as well as scenes of the Imperial funeral accorded to the remains of the victims in the presence of the Emperor following the liberation around it. A Lion of Judah also decorates the face of the obelisk. Even though the image of the Lion of Judah and the Emperor HaileSelassie were removed from all over the city during the reign of the Dergue, they surprisingly did not touch this monument. The monument stands in the Sidist Kilo square infront of the Yekatit 12 Hospital (formerly Emperor HaileSelassie Hospital and known before that as the Beite Saida Hospital). Also facing the square are the southern gates of the Guenete Leul Palace, which today is the main campus of the Addis Ababa University (formerly HaileSelassie I University). Another major attraction adjoining the square is the old Imperial Lion Zoo, where many of the old Imperial lions and their descendents live. The Churches of Menbere Leul Kidus Markos (Altar of Princes St. Marks Church) and the Meskia Hazunan Medhane Alem are both nearby, as are the former palaces of the Crown Prince (later the Political Cadre’s College during the Dergue Era), the Duke of Harrar (later the Headquarters of the Women’s wing of the Workers Party of Ethiopia), and Princess Tenagnework (later the headquarters of the Ethiopian Navy), as well as the American and Greek Embassies. Meyazia 27 Square is the official name of what is popularly known as Arat Kilo, a name that applies both to the square and the surrounding district of the city of Addis Ababa. The monument at the heart of the Square commemorates the victory over the fascist Italian invaders, and the struggle that preceded it (Meyazia 27 on the Ethiopian Calendar, May 5th on the Gregorian Calendar, is both the day that Addis Ababa was occupied by the Fascists, as well as the day that Emperor HaileSelassie returned to his capital in triumph exactly 5 years later). The original monument includes a relief of the Emperor HaileSelassie holding the national flag, which was altered during the reign of the Dergue regime into a representation of a guerrilla fighter holding the national flag. The EPRDF regime that deposed the Dergue restored the Emperor’s face to the monument. The central obelisk, topped by a Lion of Judah, actually predates the fascist occupation, and the surrounding circle of relief figures and monumental panels was added after the war. The Arat Kilo monument stands at the heart of Addis Ababa’s government district, and in front of the Ministry of Education building. Holy Trinity Cathedral (whose dome can be seen in the background) and the Parliament building are nearby, as are the present office of the Prime Minister and the Imperial Palace. Also nearby are the Science College, the Holy Trinity Theological college, Emperor Menelik II High School and the Berhan Ena Selam Printing Press. Foreign Heads of State customarily lay a wreath at this monument during state visits. This square was the focus of Victory Day celebrations held on May 5th (Meyazia 27) every year when the Emperor would lay a wreath here following his attendance at Mass at Meskia Hazunan Medhane Alem Church (Church of the Savior of the World, Consoler of the Grieved). The Dergue regime changed the date of Victory Day to the day that General Cunningham and his British, South African and Nigerian Troops actually entered the city. The post Dergue government in Ethiopia has restored Victory Day to its original date. The Lion of Judah Monument stands in the square in front of Addis Ababa’s train station. The golden colored statue of the Lion of Judah in its complete glory stands on a black granite pedestal which is decorated with relief portraits of Emperors Menelik II and Haile Selassie I, and Empress Zewditu, as well as Ras Makonnen. It marks the foot of the city’s widest and avenue, Churchill Road which has the impressive Addis Ababa City Hall at its other end. The Lion of Judah statue has a very interesting history. Erected in 1930 just before Emperor Haileselassie’s coronation, it was looted by the Italian occupiers in 1935 and taken to Rome, where it was erected next to the Vittorio Emanuelle Monument. During the 4th anniversary celebrations of the proclamation of the Italian Empire, Adolf Hitler chose to visit Rome, and attended the celebratory parades alongside the Fascist Dictator Musollini and King Victor Emanuelle III. In the parade were numerous subjects of Italy’s African Empire, including a young Eritrean named Zerai Deres. Zerai Deres was marching with other parade members carrying a ceremonial sword with which to salute the King, the Fuhrer, and el Duce, at the grandstand. As the parade marched past the Vittorio Emauelle monument, Zerai looked up and saw to his shock, the golden Lion of Judah, the symbol of the ancient monarchy to which his ancestors had long owed elegance, erected as war booty in the heart of Rome. It was too much for him to bear, and he promptly drew his sword and with tears of anger running down his face he fell on the first Italian officer he could find. He killed and wounded numerous Italian military officers before he was killed. Zerai Deres is lionized to this day as a brave Ethiopian patriot. The monument remained in Rome for several decades, and was finally returned to Addis Ababa after long negotiations in the 1960’s. When it was re-erected in its square the day it arrived, the Emperor was present in military uniform to salute, and to pay tribute to Zerai Deres. Following the revolution in 1974, the Dergue regime decided to remove the statue once more as it was a monarchist symbol. However, the elderly war veterans association members appealed to the Dergue to consider the memory of Zerai Deres and his sacrifice that was inspired by this very symbol. This act saved the statue and it stood whit all its Imperial glory right through the Dergue era, and continues to stand today. Just West of Addis Ababa’s impressive City Hall, down the hill on the main road to the Merkato district is Abune Petros Square with its impressive statue. 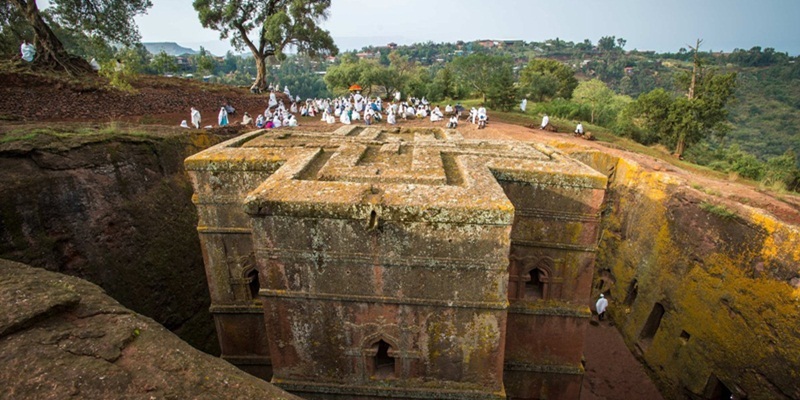 Abune Petros, the Ethiopian Orthodox Bishop of Wello who was executed by the Italians at the edge of this very square. Abune Petros was one of the four first native Ethiopians who were anointed as bishops by the Coptic Patriarch of Alexandria to serve under the Coptic born Archbishop Abune Kerllos of Ethiopia in 1932. Abune Petros was given the province of Wello as his diocese. In 1936, the Fascist armies of Benito Mussolini occupied much of Ethiopia, and Abune Petros traveled to the northern Shewan district of Menz to join the sons of Ras Kassa, Dejazmatche Wondwossen, Abera and Asfawossen Kassa and other resistance leaders to plan an attack on the Italians to drive them out of Addis Ababa. The attack failed in 1937, and the Bishop was captured. Defiantly refusing to submit to Italian rule, he was condemned to death. Shortly before his execution Abune Petros Bishop of Wello, dressed in his clerical robes, held up his hand cross and pronounced his anathema on the people and on the very earth of Ethiopia itself, if they were ever to submit to the invader. He was then shot to death in front of a horrified audience. Emperor Haileselassie had the statue erected in the memory of this great Bishop upon his restoration to the throne. The spot of his execution on the western edge of this square is also marked by a memorial slab. Sadly, during the brutal rule of the Dergue regime, the bodies of many victims of the “Red Terror” were displayed in this square. The Merkato is located in western Addis Ababa and is one of the largest markets in Africa offering an array of colors, aromas, costumes, produce and jewelers. Beware of pickpockets. In Merkato virtually every possible commodity is on sale, from livestock to computers. 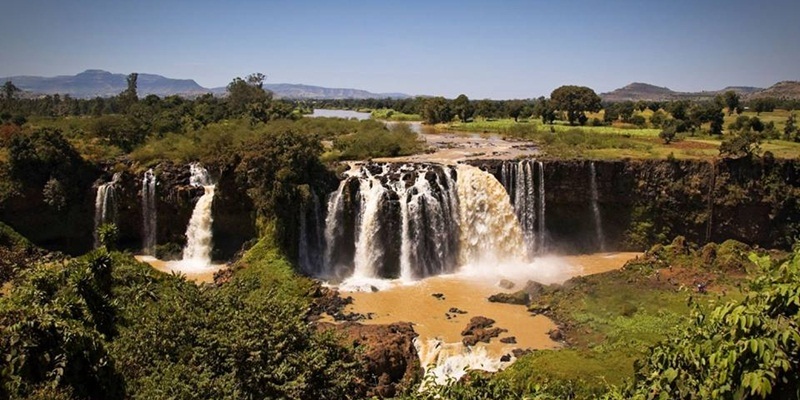 Entoto is the mountain range that rises to the north of Addis and is easily accessible from the city. This is where Menelik started his first capital, and the Church of Entonto Mariam where he was crowned can still be visited at the top of the hill is the Church of Entonto Raguel which offers stunning views.